Miyazaki striking his famous lightning pose. I am fascinated by the elderly people in Japan. 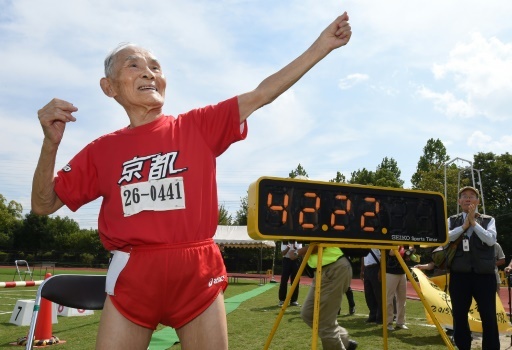 Last week I read that Hidekichi Miyazaki, the Japanese centenarian who set the 100 meter sprint world record for the over-105 age category, died at the age of 108. He liked to be called the "Golden Bolt", after eight time Olympic gold medalist Usain Bolt. He was born in 1910 and started running in his 90's. In 2015, he set the record in the 100 meter in the over-105 age category (before which no mark had been set) with a time of 42.22 seconds in his home city of Kyoto. How inspiring! It's never too late to start doing something new. WOW ... what a man, what an achievement and inspiration to the younger people. This proves my theory that if one starts to run at a more advanced age, one can be a great runner because they don't have all the injuries that those of us who have been running since we were young do! I really like Kate's comment! A great way to look to the future. He enjoyed himself and reminds us to try something new at any age. What a life and career. Definitely an inspiration! That truly is awe-inspiring! And here I sit at 29, complaining that running is exhausting.